CJ 4DPLEX is continuing its robust global market expansion mandate for ScreenX by entering into new partnerships with the leading multiplex operators all over the world and opening new ScreenX sites through the strong partnerships with existing partners. In fact, just last month the company entered into a new partnership with Multinational cinema operator Cineworld Group to install ScreenX technology at 100 theatres in the U.S., U.K., and eight other international locations. The ScreenX platform is the world's first multi-projection theatre technology designed to enhance the movie going experience. ScreenX allows moviegoers to go beyond the frame of the traditional movie screen, utilizing a proprietary system to expand images of feature films and pre-show advertising to the left and right walls of the theatre, creating an immersive, panoramic, 270-degree experience. 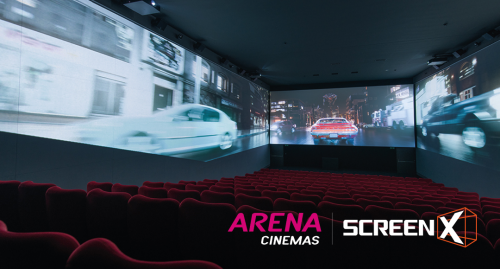 As part of this overall expansion, CJ 4DPLEX is scheduled to open three ScreenX sites in Switzerland during July through a partnership with ARENA Cinemas, with the action-adventure movie Ant-Man and The Wasp. The company is also experiencing strong 4DX format showings on the continent for tentpole blockbuster films. ARENA Cinemas Fribourg, Switzerland opened on July 18. ARENA Cinemas Geneva, Switzerland opened on July 18. ARENA Cinemas Zurich, Switzerland will open on July 26. "We are thrilled to be working with such great partners as Les Cinémas Gaumont Pathé and ARENA Cinemas to bring ScreenX to theatres in Europe for the first time. We've already witnessed a high degree of success in Europe with 4DX, and through these relationships will introduce ScreenX, bringing a new level of immersion and storytelling to European movie-goers," said Byung-Hwan Choi, CEO of CJ 4DPLEX. "It is impressive what great innovations CJ 4DPLEX has brought to the cinema experience. We proudly welcome ScreenX, this trend-setting movie experience. We anticipate this state-of-the-art cinema technology will be a driver for more attendance as we have already made a great success with 4DX," said Edouard A. Stöckli, Owner of ARENA Cinemas.